You are currently browsing articles tagged Second Presbytery. Who died 29th January, 1801, in the 68th year of his age. Religion one of its brightest ornaments, and most amiable examples. His genius was masterly, and his literature extensive. As a classical scholar, he was excelled by few. His taste correct, his style nervous and elegant. In the pulpit he was a model. In the judicatures of the Church, distinguished by his accuracy and precision. He rested from his labours, lamented most by those who knew his words. Having read that assessment of the man, it might easily be said, “There were giants in those days.” James Latta was born in Ireland in the winter of 1732, migrating to this country when he was just six or seven years old. Ordained an evangelist by the Presbytery of Philadelphia in the fall of 1759, he was later installed as pastor of the Deep Run church in Bucks County, Pennsylvania in 1761. He remained in this pulpit until 1770. resigning there to answer a call to serve the congregation of Chestnut Level, in Lancaster county, PA. One account notes that “the congregation at that time was widely scattered and weak. The salary promised in the call was only one hundred pounds, Pennsylvania currency, which was never increased, and rarely all paid.” Friends prevailed upon him to educate their sons, and the school he reluctantly started prospered, until the Revolutionary war brought things to a close, with many of the older students joining the army. On the 28th day of May, 1762, the Second Presbytery of Philadelphia was set off by the Synod from the Presbytery of Philadelphia. This consisted of five ministers, of whom Mr. Latta was one; and they were all strenuous advocates of what was called the Old Side. It appears from certain dissents and protests, in 1766, when an ineffectual attempt was made in Synod to reunite the two Presbyteries, that this Second Presbytery had been formed on the elective affinity principle, as its members professed to be conscientiously opposed to the practice of examining candidates for the ministry on their experimental acquaintance with religion, which the Synod had approved of; and had declared that sooner than remain in a Presbytery which pursued that practice, they would break off from all connection with the Synod. During the war, Rev. Latta served as a private and a chaplain in the Pennsylvania Militia, and after the war, he returned to his pulpit in Chestnut Level. The first General Assembly of the Presbyterian Church in the U.S.A. convened in 1789. Two years later, Rev. Latta was honored to serve as the Moderator of the third General Assembly, in 1791. 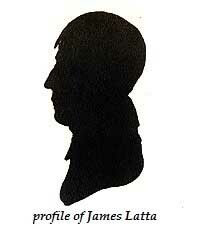 Latta continued as the pastor of the Chestnut Level congregation until the time of his death, in 1801. Dr. Latta laboured on in the ministry, until very near the close of life. In December, a month before his decease, he attended a meeting of his Presbytery at New London, twenty miles from home. The circumstances of his death, as related by one of his daughters, were as follows:—Riding to church one Sabbath with his daughter Mary, he was thrown from the carriage, and falling on his head, he was somewhat stunned. He observed to her,—-“I am killed; but do not tell your mother.” He proceeded to church, preached with some difficulty, and returned home. He soon after fell into a sleepy, comatose state, until his daughter, the next day, alarmed, related to her mother what had happened. Help was immediately called in, but in vain. He continued a few days, almost insensible, and then died. Words to Live By: Rev. Latta’s biographer says of him, that as a preacher, he was faithful to declare the whole counsel of God. While he comforted and encouraged true Christians, he held up to sinners a glass in which they might see themselves; but, in addressing them, he always spoke as with the compassion of a father. The doctrines of Grace were the burden of his preaching.” God give us faithful pastors who will minister the Word of God in Spirit and in truth.